Bloody Sunday, or the Bogside Massacre, was an incident on 30 January 1972 in the Bogside area of Derry, Northern Ireland, when British soldiers shot 28 unarmed civilians during a protest march against internment. Fourteen people died: thirteen were killed outright, while the death of another man four months later was attributed to his injuries. Many of the victims were shot while fleeing from the soldiers and some were shot while trying to help the wounded. Other protesters were injured by rubber bullets or batons, and two were run down by army vehicles. All of those shot were Catholics. The march had been organised by the Northern Ireland Civil Rights Association (NICRA). The soldiers were from the 1st Battalion, Parachute Regiment ("1 Para"). This battalion was involved in two other controversial shootings: the Ballymurphy massacre several months before, and the killing of Protestant civilians in the Shankill several months later. Two investigations were held by the British government. The Widgery Tribunal, held in the immediate aftermath, largely cleared the soldiers and British authorities of blame. It described the soldiers' shooting as "bordering on the reckless", but accepted their claims that they shot at gunmen and bomb-throwers. The report was widely criticised as a "whitewash". The Saville Inquiry, chaired by Lord Saville of Newdigate, was established in 1998 to reinvestigate the incident. Following a 12-year inquiry, Saville's report was made public in 2010 and concluded that the killings were both "unjustified" and "unjustifiable". It found that all of those shot were unarmed, that none were posing a serious threat, that no bombs were thrown, and that soldiers "knowingly put forward false accounts" to justify their firing. The soldiers denied shooting the named victims, but also denied shooting anyone by mistake. On its publication, British prime minister David Cameron made a formal apology on behalf of the United Kingdom. Following this, police began a murder investigation into the killings. Bloody Sunday was one of the most significant events of the Troubles because a large number of civilians were killed, by forces of the state, in full view of the public and the press. It was the highest number of people killed in a single shooting incident during the conflict. Bloody Sunday fueled Catholic and Irish nationalist hostility towards the British Army and worsened the conflict. Support for the Provisional Irish Republican Army (IRA) rose and there was a surge of recruitment into the organisation, especially locally. The City of Derry was perceived by many Catholics and Irish nationalists in Northern Ireland to be the epitome of what was described as "fifty years of Unionist misrule": despite having a nationalist majority, gerrymandering ensured elections to the City Corporation always returned a unionist majority. At the same time the city was perceived to be deprived of public investment – , motorways were not extended to it, a university was opened in the relatively small (Protestant-majority) town of Coleraine rather than Derry and, above all, the city's housing stock was in an appalling state. The city therefore became a significant focus of the civil rights campaign led by organisations such as Northern Ireland Civil Rights Association (NICRA) in the late 1960s and it was in Derry that the so-called Battle of the Bogside – the event that more than any other pushed the Northern Ireland administration to ask for military support for civil policing – took place in August 1969. While many Catholics initially welcomed the British Army as a neutral force, in contrast to what was regarded as a sectarian police force, relations between them soon deteriorated. In response to escalating levels of violence across Northern Ireland, internment without trial was introduced on 9 August 1971. There was disorder across Northern Ireland following the introduction of internment, with 21 people being killed in three days of rioting. In Belfast, soldiers of the Parachute Regiment shot dead 11 Catholic civilians in what became known as the Ballymurphy Massacre. On 10 August, Bombardier Paul Challenor became the first soldier to be killed by the Provisional IRA in Derry, when he was shot by a sniper on the Creggan estate. A further six soldiers had been killed in Derry by mid-December 1971. At least 1,332 rounds were fired at the British Army, who also faced 211 explosions and 180 nail bombs, and who fired 364 rounds in return. IRA activity also increased across Northern Ireland with thirty British soldiers being killed in the remaining months of 1971, in contrast to the ten soldiers killed during the pre-internment period of the year. Both the Official IRA and Provisional IRA had established no-go areas for the British Army and Royal Ulster Constabulary (RUC) in Derry through the use of barricades. By the end of 1971, 29 barricades were in place to prevent access to what was known as Free Derry, 16 of them impassable even to the British Army's one-ton armoured vehicles. IRA members openly mounted roadblocks in front of the media, and daily clashes took place between nationalist youths and the British Army at a spot known as "aggro corner". Due to rioting and damage to shops caused by incendiary devices, an estimated total of £4 million worth of damage had been caused to local businesses. On 18 January 1972, Brian Faulkner, Prime Minister of Northern Ireland, banned all parades and marches in Northern Ireland until the end of the year. On 22 January 1972, a week before Bloody Sunday, an anti-internment march was held at Magilligan strand, near Derry. The protesters marched to a new internment camp there, but were stopped by soldiers of the Parachute Regiment. When some protesters threw stones and tried to go around the barbed wire, paratroopers drove them back by firing rubber bullets at close range and making baton charges. The paratroopers badly beat a number of protesters and had to be physically restrained by their own officers. These allegations of brutality by paratroopers were reported widely on television and in the press. Some in the Army also thought there had been undue violence by the paratroopers. NICRA intended, despite the ban, to hold another anti-internment march in Derry on Sunday 30 January. The authorities decided to allow it to proceed in the Catholic areas of the city, but to stop it from reaching Guildhall Square, as planned by the organisers. The authorities expected that this would lead to rioting. Major General Robert Ford, then Commander of Land Forces in Northern Ireland, ordered that the 1st Battalion, Parachute Regiment (1 Para), should travel to Derry to be used to arrest possible rioters. The arrest operation was codenamed 'Operation Forecast'. The Saville Report criticised General Ford for choosing the Parachute Regiment for the operation, as it had "a reputation for using excessive physical violence". The paratroopers arrived in Derry on the morning of the march and took up positions in the city. Brigadier Pat MacLellan was the operational commander and issued orders from Ebrington Barracks. He gave orders to Lieutenant Colonel Derek Wilford, commander of 1 Para. He in turn gave orders to Major Ted Loden, who commanded the company who launched the arrest operation. The protesters planned on marching from Bishop's Field, in the Creggan housing estate, to the Guildhall, in the city centre, where they would hold a rally. The march set off at about 2:45pm. There were 10,000–15,000 people on the march, with many joining along its route. Lord Widgery, in his now discredited tribunal, said that there were only 3,000 to 5,000. The march made its way along William Street but, as it neared the city centre, its path was blocked by British Army barriers. The organisers redirected the march down Rossville Street, intending to hold the rally at Free Derry Corner instead. However, some broke off from the march and began throwing stones at soldiers manning the barriers. The soldiers fired rubber bullets, CS gas and water cannon to try to disperse the rioters. Such clashes between soldiers and youths were common, and observers reported that the rioting was not intense. Some of the crowd spotted paratroopers occupying a derelict three-story building overlooking William Street, and began throwing stones at the windows. At about 3:55pm, these paratroopers opened fire. Civilians Damien Donaghy and John Johnston were shot and wounded while standing on waste ground opposite the building. These were the first shots fired. The soldiers claimed Donaghy was holding a black cylindrical object, but the Saville Inquiry concluded that all of those shot were unarmed. At 4:07pm, the paratroopers were ordered to go through the barriers and arrest rioters. The paratroopers, on foot and in armoured vehicles, chased people down Rossville Street and into the Bogside. Two people were knocked down by the vehicles. Brigadier MacLellan had ordered that only one company of paratroopers be sent through the barriers, on foot, and that they should not chase people down Rossville Street. Colonel Wilford disobeyed this order, which meant there was no separation between rioters and peaceful marchers. The paratroopers disembarked and began seizing people. There were many claims of paratroopers beating people, clubbing them with rifle butts, firing rubber bullets at them from close range, making threats to kill, and hurling abuse. The Saville Report agreed that soldiers "used excessive force when arresting people […] as well as seriously assaulting them for no good reason while in their custody". One group of paratroopers took up position at a low wall about 80 yards (73 m) in front of a rubble barricade that stretched across Rossville Street. There were people at the barricade and some were throwing stones at the soldiers, but none were near enough to hit them. The soldiers fired on the people at the barricade, killing six and wounding a seventh. A large group of people fled or were chased into the car park of Rossville Flats. This area was like a courtyard, surrounded on three sides by high-rise flats. The soldiers opened fire, killing one civilian and wounding six others. This fatality, Jackie Duddy, was running alongside a priest, Father Edward Daly, when he was shot in the back. Another group of people fled into the car park of Glenfada Park, which was also a courtyard-like area surrounded by flats. Here, the soldiers shot at people across the car park, about 40–50 yards away. Two civilians were killed and at least four others wounded. The Saville Report says it is "probable" that at least one soldier fired from the hip towards the crowd, without aiming. The soldiers went through the car park and out the other side. Some soldiers went out the southwest corner, where they shot dead two civilians. The other soldiers went out the southeast corner and shot four more civilians, killing two. About ten minutes had elapsed between the time soldiers drove into the Bogside and the time the last of the civilians was shot. More than 100 rounds were fired by the soldiers. Some of those shot were given first aid by civilian volunteers, either on the scene or after being carried into nearby homes. They were then driven to hospital, either in civilian cars or in ambulances. The first ambulances arrived at 4:28pm. The three boys killed at the rubble barricade were driven to hospital by the paratroopers. Witnesses said paratroopers lifted the bodies by the hands and feet and dumped them in the back of their APC, as if they were "pieces of meat". The Saville Report agreed that this is an "accurate description of what happened". It says the paratroopers "might well have felt themselves at risk, but in our view this does not excuse them". In all, 28 people were shot by the paratroopers; 13 died on the day and another died of his injuries four months later. The dead were killed in four main areas: the rubble barricade across Rossville Street, the courtyard car park of Rossville Flats (on the north side of the flats), the courtyard car park of Glenfada Park, and the forecourt of Rossville Flats (on the south side of the flats). All of the soldiers responsible insisted that they had shot at, and hit, gunmen or bomb-throwers. No soldier said he missed his target and hit someone else by mistake. The Saville Report concluded that all of those shot were unarmed and that none were posing a serious threat. It also concluded that none of the soldiers fired in response to attacks, or threatened attacks, by gunmen or bomb-throwers. No warnings were given before soldiers opened fire. The casualties are listed in the order in which they were killed. John 'Jackie' Duddy, age 17. Shot as he ran away from soldiers in the car park of Rossville Flats. The bullet struck him in the shoulder and entered his chest. Three witnesses said they saw a soldier take deliberate aim at the youth as he ran. He was the first fatality on Bloody Sunday. Both Saville and Widgery concluded that Duddy was unarmed. Michael Kelly, age 17. Shot in the stomach while standing at the rubble barricade on Rossville Street. Both Saville and Widgery concluded that Kelly was unarmed. The Saville Inquiry concluded that 'Soldier F' shot Kelly. Hugh Gilmour, age 17. Shot as he ran away from soldiers near the rubble barricade. The bullet went through his left elbow and entered his chest. Widgery acknowledged that a photograph taken seconds after Gilmour was hit corroborated witness reports that he was unarmed. The Saville Inquiry concluded that 'Private U' shot Gilmour. William Nash, age 19. Shot in the chest at the rubble barricade. Three people were shot while apparently going to his aid, including his father Alexander Nash. John Young, age 17. Shot in the face at the rubble barricade, apparently while crouching and going to the aid of William Nash. Michael McDaid, age 20. Shot in the face at the rubble barricade, apparently while crouching and going to the aid of William Nash. Kevin McElhinney, age 17. Shot from behind, near the rubble barricade, while attempting to crawl to safety. James 'Jim' Wray, age 22. Shot in the back while running away from soldiers in Glenfada Park courtyard. He was then shot again in the back as he lay mortally wounded on the ground. Witnesses, who were not called to the Widgery Tribunal, stated that Wray was calling out that he could not move his legs before he was shot the second time. 'Soldier F' faces charges for his murder. William McKinney, age 26. Shot in the back as he attempted to flee through Glenfada Park courtyard. 'Soldier F' faces charges for his murder. Gerard 'Gerry' McKinney, age 35. Shot in the chest at Abbey Park. A soldier, identified as 'Private G', ran through an alleyway from Glenfada Park and shot him from a few yards away. Witnesses said that when he saw the soldier, McKinney stopped and held up his arms, shouting "Don't shoot! Don't shoot! ", before being shot. The bullet apparently went through his body and struck Gerard Donaghy behind him. Gerard 'Gerry' Donaghy, age 17. Shot in the stomach at Abbey Park while standing behind Gerard McKinney. Both were apparently struck by the same bullet. Bystanders brought Donaghy to a nearby house. A doctor examined him, and his pockets were searched for identification. Two bystanders then attempted to drive Donaghy to hospital, but the car was stopped at an Army checkpoint. They were ordered to leave the car and a soldier drove it to a Regimental Aid Post, where an Army medical officer pronounced Donaghy dead. Shortly after, soldiers found four nail bombs in his pockets. The civilians who searched him, the soldier who drove him to the Army post, and the Army medical officer, all said that they did not see any bombs. This led to claims that soldiers planted the bombs on Donaghy to justify the killings. Donaghy was a member of Fianna Éireann, an IRA-linked republican youth movement. Paddy Ward, a police informer, told the Saville Inquiry he gave two nail bombs to Donaghy several hours before he was shot. The Inquiry concluded that the bombs were probably in Donaghy's pockets when he was shot; but that he was not about to throw a bomb when he was shot, and was not shot because he had bombs. "He was shot while trying to escape from the soldiers". 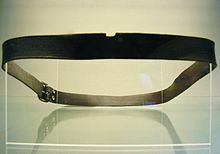 Belt worn by Patrick Doherty. The notch was made by the bullet that killed him. Patrick Doherty, age 31. Shot from behind while attempting to crawl to safety in the forecourt of Rossville Flats. The Saville Inquiry concluded that he was shot by 'Soldier F', who came out of Glenfada Park. Doherty was photographed, moments before and after he died, by French journalist Gilles Peress. Despite testimony from 'Soldier F' that he had shot a man holding a pistol, Widgery acknowledged that the photographs show Doherty was unarmed, and that forensic tests on his hands for gunshot residue proved negative. Bernard 'Barney' McGuigan, age 41. Shot in the back of the head when he walked out from cover to help Patrick Doherty. He had been waving a white handkerchief to indicate his peaceful intentions. The Saville Inquiry concluded that he was shot by 'Soldier F'. John Johnston, age 59. Shot in the leg and left shoulder on William Street 15 minutes before the rest of the shooting started. Johnston was not on the march, but on his way to visit a friend in Glenfada Park. He died on 16 June 1972; his death has been attributed to the injuries he received on the day. He was the only one not to die immediately or soon after being shot. Thirteen people were shot and killed, with another man later dying of his wounds. The official army position, backed by the British Home Secretary the next day in the House of Commons, was that the paratroopers had reacted to gun and nail bomb attacks from suspected IRA members. Apart from the soldiers, all eyewitnesses—including marchers, local residents, and British and Irish journalists present—maintain that soldiers fired into an unarmed crowd, or were aiming at fleeing people and those tending the wounded, whereas the soldiers themselves were not fired upon. No British soldier was wounded by gunfire or reported any injuries, nor were any bullets or nail bombs recovered to back up their claims. On 2 February 1972, the day that 12 of those killed were buried, there was a general strike in the Republic. It was described as the biggest general strike in Europe since the Second World War relative to population. Memorial services were held in Catholic and Protestant churches, as well as synagogues, throughout the Republic. The same day, irate crowds burned down the British embassy on Merrion Square in Dublin. Anglo-Irish relations hit one of their lowest ebbs with the Irish Minister for Foreign Affairs, Patrick Hillery, going to the United Nations Security Council in New York to demand the involvement of a UN peacekeeping force in the Northern Ireland conflict. In the days following Bloody Sunday, Bernadette Devlin, the independent Irish nationalist Member of Parliament for Mid Ulster, expressed anger at what she perceived as British government attempts to stifle accounts being reported about the shootings. Having witnessed the events firsthand, she was infuriated that Speaker Selwyn Lloyd consistently denied her the chance to speak in Parliament about the shootings, although parliamentary convention decreed that any MP witnessing an incident under discussion would be granted an opportunity to speak about it in Parliament. Devlin slapped Reginald Maudling, the Secretary of State for the Home Department in the Conservative government, when he made a statement to Parliament that the British Army had fired only in self-defence. She was temporarily suspended from Parliament as a result. This Sunday became known as Bloody Sunday and bloody it was. It was quite unnecessary. It strikes me that the Army ran amok that day and shot without thinking what they were doing. They were shooting innocent people. These people may have been taking part in a march that was banned but that does not justify the troops coming in and firing live rounds indiscriminately. I would say without hesitation that it was sheer, unadulterated murder. It was murder. Several months after Bloody Sunday, the 1st Battalion Parachute Regiment—again under Lt Col Derek Wilford—were involved in another controversial shooting incident. On 7 September, 1 Para raided houses and the headquarters of the Ulster Defence Association (UDA) in the Protestant Shankill area of Belfast. Two Protestant civilians were shot dead and others wounded by the paratroopers, who claimed they were returning fire at loyalist gunmen. This sparked angry demonstrations by local Protestants, and the UDA declared: "Never has Ulster witnessed such licensed sadists and such blatant liars as the 1st Paras. These gun-happy louts must be removed from the streets". A unit of the British Army's Ulster Defence Regiment refused to carry out duties until 1 Para was withdrawn from the Shankill. At the end of 1972, Lt Col Wilford, who was directly in charge of the soldiers involved in Bloody Sunday, was awarded the Order of the British Empire by Queen Elizabeth II. In 1992, John Major, writing to John Hume stated: "The Government made clear in 1974 that those who were killed on 'Bloody Sunday' should be regarded as innocent of any allegation that they were shot whilst handling firearms or explosives". In 2007, General (then Captain) Sir Mike Jackson, adjutant of 1 Para on Bloody Sunday, said: "I have no doubt that innocent people were shot". This was in sharp contrast to his insistence, for more than 30 years, that those killed on the day had not been innocent. In 2008 a former aide to British prime minister Tony Blair, Jonathan Powell, described Widgery as a "complete and utter whitewash". In 1998, Lt Col Derek Wilford expressed his anger at Tony Blair's intention of setting up the Saville inquiry, stating that he was proud of his actions on Bloody Sunday. Two years later in 2000 during an interview with the BBC, Wilford said: "There might have been things wrong in the sense that some innocent people, people who were not carrying a weapon, were wounded or even killed. But that was not done as a deliberate malicious act. It was done as an act of war". Most witnesses to the event disputed the report's conclusions and regarded it as a whitewash, the slogan "Widgery washes whiter" - a play on the contemporary advertisment for Daz soap powder - emblazoned on walls in Derry, crystallized the views of many nationalists about the report. Although there were many IRA men—both Official and Provisional—at the protest, it is claimed they were all unarmed, apparently because it was anticipated that the paratroopers would attempt to "draw them out". March organiser and MP Ivan Cooper had been promised beforehand that no armed IRA men would be near the march. One paratrooper who gave evidence at the tribunal testified that they were told by an officer to expect a gunfight and "We want some kills". In the event, one man was witnessed by Father Edward Daly and others haphazardly firing a revolver in the direction of the paratroopers. Later identified as a member of the Official IRA, this man was also photographed in the act of drawing his weapon, but was apparently not seen or targeted by the soldiers. Various other claims have been made to the Saville Inquiry about gunmen on the day. Although British prime minister John Major rejected John Hume's requests for a public inquiry into the killings, his successor, Tony Blair, decided to start one. A second commission of inquiry, chaired by Lord Saville, was established in January 1998 to re-examine Bloody Sunday. The other judges were John Toohey QC, a former Justice of the High Court of Australia who had worked on Aboriginal issues (he replaced New Zealander Sir Edward Somers QC, who retired from the Inquiry in 2000 for personal reasons), and Mr Justice William Hoyt QC, former Chief Justice of New Brunswick and a member of the Canadian Judicial Council. The hearings were concluded in November 2004, and the report was published 15 June 2010. The Saville Inquiry was a more comprehensive study than the Widgery Tribunal, interviewing a wide range of witnesses, including local residents, soldiers, journalists and politicians. Lord Saville declined to comment on the Widgery report and made the point that the Saville Inquiry was a judicial inquiry into Bloody Sunday, not the Widgery Tribunal. Evidence given by Martin McGuinness, a senior member of Sinn Féin and later the deputy First Minister of Northern Ireland, to the inquiry stated that he was second-in-command of the Derry City brigade of the Provisional IRA and was present at the march. A claim was made at the Saville Inquiry that McGuinness was responsible for supplying detonators for nail bombs on Bloody Sunday. Paddy Ward claimed he was the leader of the Fianna Éireann, the youth wing of the PIRA in January 1972. He claimed that McGuinness, the second-in-command of the PIRA in the city at the time, and another anonymous PIRA member gave him bomb parts on the morning of 30 January, the date planned for the civil rights march. He said his organisation intended to attack city-centre premises in Derry on the day when civilians were shot dead by British soldiers. In response McGuinness rejected the claims as "fantasy", while Gerry O'Hara, a Sinn Féin councillor in Derry stated that he and not Ward was the Fianna leader at the time. Many observers allege that the Ministry of Defence acted in a way to impede the inquiry. Over 1,000 army photographs and original army helicopter video footage were never made available. Additionally, guns used on the day by the soldiers that could have been evidence in the inquiry were lost by the MoD. The MoD claimed that all the guns had been destroyed, but some were subsequently recovered in various locations (such as Sierra Leone and Beirut) despite the obstruction. By the time the inquiry had retired to write up its findings, it had interviewed over 900 witnesses, over seven years, making it the biggest investigation in British legal history. The cost of this process has drawn criticism; as of the publication of the Saville Report being £195 million. The inquiry was expected to report in late 2009 but was delayed until after the general election on 6 May 2010. The report of the inquiry was published on 15 June 2010. The report concluded, "The firing by soldiers of 1 PARA on Bloody Sunday caused the deaths of 13 people and injury to a similar number, none of whom was posing a threat of causing death or serious injury." Saville stated that British paratroopers "lost control", fatally shooting fleeing civilians and those who tried to aid civilians who had been shot by the British soldiers. The report stated that British soldiers had concocted lies in their attempt to hide their acts. Saville stated that the civilians had not been warned by the British soldiers that they intended to shoot. The report states, contrary to previous assertions, that no stones and no petrol bombs were thrown by civilians before British soldiers shot at them, and that the civilians were not posing any threat. The report concluded that an Official IRA sniper fired on British soldiers, albeit that on the balance of evidence his shot was fired after the Army shots that wounded Damien Donaghey and John Johnston. The Inquiry rejected the sniper's account that this shot had been made in reprisal, stating the view that he and another Official IRA member had already been in position, and the shot had probably been fired simply because the opportunity had presented itself. Ultimately the Saville Inquiry was inconclusive on Martin McGuinness's role, due to a lack of certainty over his movements, concluding that while he was "engaged in paramilitary activity" during Bloody Sunday, and had probably been armed with a Thompson submachine gun, there was insufficient evidence to make any finding other than they were "sure that he did not engage in any activity that provided any of the soldiers with any justification for opening fire". Lieutenant Colonel Derek Wilford: Commander of 1 Para and directly responsible for arresting rioters and returning to base. Found to have 'deliberately disobeyed' his superior Brigadier Patrick MacLellan's orders by sending Support Company into the Bogside (and without informing MacLellan). Major Ted Loden: Commander in charge of soldiers, following orders issued by Lieutenant Colonel Wilford. Cleared of misconduct; Saville cited in the report that Loden "neither realised nor should have realised that his soldiers were or might be firing at people who were not posing or about to pose a threat". The inquiry found that Loden could not be held responsible for claims (whether malicious or not) by some of the individual soldiers that they had received fire from snipers. Captain Mike Jackson: Second in command of 1 Para on the day of Bloody Sunday. Cleared of sinister actions following Jackson's compiling of a list of what soldiers told Major Loden on why they had fired. This list became known as the "Loden List of Engagements" which played a role in the Army's initial explanations. While the inquiry found the compiling of the list was 'far from ideal', Jackson's explanations were accepted based on the list not containing the names of soldiers and the number of times they fired. Major General Robert Ford: Commander of land forces and set the British strategy to oversee the civil march in Derry. Cleared of any fault, but his selection of 1 Para, and in particular his selection of Colonel Wilford to be in control of arresting rioters, was found to be disconcerting, specifically as "1 PARA was a force with a reputation for using excessive physical violence, which thus ran the risk of exacerbating the tensions between the Army and nationalists". Brigadier Pat MacLellan: Operational commander of the day. Cleared of any wrongdoing as he was under the impression that Wilford would follow orders by arresting rioters and then returning to base, and could not be blamed for Wilford's actions. Major Michael Steele: With MacLellan in the operations room and in charge of passing on the orders of the day. The inquiry report accepted that Steele could not believe other than that a separation had been achieved between rioters and marchers, because both groups were in different areas. Other soldiers: Lance Corporal F was found responsible for a number of the deaths and that a number of soldiers have "knowingly put forward false accounts in order to seek to justify their firing". Intelligence officer Colonel Maurice Tugwell and Colin Wallace, (an IPU army press officer): Cleared of wrongdoing. Saville believed the information Tugwell and Wallace released through the media was not down to any deliberate attempt to deceive the public but rather due to much of the inaccurate information Tugwell had received at the time by various other figures. Mr Speaker, I am deeply patriotic. I never want to believe anything bad about our country. I never want to call into question the behaviour of our soldiers and our army, who I believe to be the finest in the world. And I have seen for myself the very difficult and dangerous circumstances in which we ask our soldiers to serve. But the conclusions of this report are absolutely clear. There is no doubt, there is nothing equivocal, there are no ambiguities. What happened on Bloody Sunday was both unjustified and unjustifiable. It was wrong. Following the publication of the Saville Report, a murder investigation was begun by the Police Service of Northern Ireland's Legacy Investigation Branch. On 10 November 2015, a 66-year-old former member of the Parachute Regiment was arrested for questioning over the deaths of William Nash, Michael McDaid and John Young. He was released on bail shortly after. The Public Prosecution Service for Northern Ireland (PPS) announced in March 2019 that there was enough evidence to prosecute "Soldier F" for the murders of James Wray and William McKinney, both of whom were shot in the back. He will also be charged with four attempted murders. The Saville Inquiry concluded, based on the evidence, that "Soldier F" also killed Michael Kelly, Patrick Doherty and Barney McGuigan, but evidence from the inquiry was inadmissible to the prosecution and "the only evidence capable of identifying the soldier who fired the relevant shots came from Soldier F's co-accused, Soldier G, who is deceased". Relatives of the Bloody Sunday victims expressed feelings of devastation that only one soldier would face trial for the killings. Harold Wilson, then the Leader of the Opposition in the House of Commons, reiterated his belief that a united Ireland was the only possible solution to Northern Ireland's Troubles. William Craig, then Stormont Home Affairs Minister, suggested that the west bank of Derry should be ceded to the Republic of Ireland. When it was deployed on duty in Northern Ireland, the British Army was welcomed by Roman Catholics as a neutral force there to protect them from Protestant mobs, the RUC and the B-Specials. After Bloody Sunday many Catholics turned on the British army, seeing it no longer as their protector but as their enemy. Young nationalists became increasingly attracted to violent republican groups. With the Official IRA and Official Sinn Féin having moved away from mainstream Irish republicanism towards Marxism, the Provisional IRA began to win the support of newly radicalised, disaffected young people. In the following twenty years, the Provisional Irish Republican Army and other smaller republican groups such as the Irish National Liberation Army (INLA) stepped up their armed campaigns against the state and those seen as being in service to it. With rival paramilitary organisations appearing in both the nationalist/republican and unionist/loyalist communities (such as the Ulster Defence Association (UDA), Ulster Volunteer Force (UVF), etc. on the loyalist side), the Troubles cost the lives of thousands of people. In his speech to the House of Commons on the Inquiry, British prime minister David Cameron stated: "These are shocking conclusions to read and shocking words to have to say. But you do not defend the British Army by defending the indefensible." He acknowledged that all those who died were unarmed when they were killed by British soldiers, and that a British soldier had fired the first shot at civilians. He also said that this was not a premeditated action, though "there was no point in trying to soften or equivocate" as "what happened should never, ever have happened". Cameron then apologised on behalf of the British Government by saying he was "deeply sorry". A survey conducted by Angus Reid Public Opinion in June 2010 found that 61 per cent of Britons and 70 per cent of Northern Irish agreed with Cameron's apology for the Bloody Sunday events. Stephen Pollard, solicitor representing several of the soldiers, said on 15 June 2010 that Saville had cherry-picked the evidence and did not have justification for his findings. In 2012 an actively serving British army soldier from Belfast was charged with inciting hatred by a surviving relative of the deceased, due to their online use of social media to promote sectarian slogans about the killings while featuring banners of the Parachute Regiment logo. In January 2013, shortly before the annual Bloody Sunday remembrance march, two Parachute Regiment flags appeared in the loyalist Fountain, and Waterside, Drumahoe areas of Derry. The display of the flags was heavily criticised by nationalist politicians and relatives of the Bloody Sunday dead. The Ministry of Defence also condemned the flying of the flags. 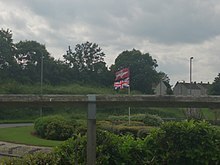 The flags were removed to be replaced by Union Flags. In the run up to the loyalist marching season in 2013 the flag of the Parachute Regiment appeared alongside other loyalist flags in other parts of Northern Ireland. In 2014 loyalists in Cookstown erected the flags in opposition, close to the route of a St.Patrick's Day parade in the town. Paul McCartney (who is of Irish descent) recorded the first song in response only two days after the incident. The single, entitled "Give Ireland Back to the Irish", expressed his views on the matter. This song was one of few McCartney released with Wings to be banned by the BBC. The 1972 John Lennon album Some Time in New York City features a song entitled "Sunday Bloody Sunday", inspired by the incident, as well as the song "The Luck of the Irish", which dealt more with the Irish conflict in general. Lennon, who was of Irish descent, also spoke at a protest in New York in support of the victims and families of Bloody Sunday. Irish poet Thomas Kinsella's 1972 poem Butcher's Dozen is a satirical and angry response to the Widgery Tribunal and the events of Bloody Sunday. Black Sabbath's Geezer Butler (also of Irish descent) wrote the lyrics to the Black Sabbath song "Sabbath Bloody Sabbath" on the album of the same name in 1973. Butler stated, "…the Sunday Bloody Sunday thing had just happened in Ireland, when the British troops opened fire on the Irish demonstrators… So I came up with the title 'Sabbath Bloody Sabbath', and sort of put it in how the band was feeling at the time, getting away from management, mixed with the state Ireland was in." The Roy Harper song "All Ireland" from the album Lifemask, written in the days following the incident, is critical of the military but takes a long term view with regard to a solution. In Harper's book (The Passions of Great Fortune), his comment on the song ends "…there must always be some hope that the children of 'Bloody Sunday', on both sides, can grow into some wisdom". Brian Friel's 1973 play The Freedom of the City deals with the incident from the viewpoint of three civilians. Irish poet Seamus Heaney's Casualty (published in Field Work, 1981) criticizes Britain for the death of his friend. The incident has been commemorated by Irish band U2 in their 1983 protest song "Sunday Bloody Sunday". Christy Moore's song "Minds Locked Shut" on the album Graffiti Tongue is all about the events of the day, and names the dead civilians. The events of the day have been dramatised in two 2002 television films, Bloody Sunday (starring James Nesbitt) and Sunday by Jimmy McGovern. The Celtic metal band Cruachan addressed the incident in a song "Bloody Sunday" from their 2004 album Folk-Lore. Willie Doherty, a Derry-born artist, has amassed a large body of work which addresses the troubles in Northern Ireland. "30 January 1972" deals specifically with the events of Bloody Sunday. 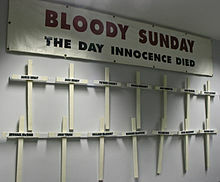 In mid-2005, the play Bloody Sunday: Scenes from the Saville Inquiry, a dramatisation based on the Saville Inquiry, opened in London, and subsequently travelled to Derry and Dublin. The writer, journalist Richard Norton-Taylor, distilled four years of evidence into two hours of stage performance by Tricycle Theatre. The play received glowing reviews in all the British broadsheets, including The Times: "The Tricycle's latest recreation of a major inquiry is its most devastating"; The Daily Telegraph: "I can't praise this enthralling production too highly… exceptionally gripping courtroom drama"; and The Independent: "A necessary triumph". In October 2010, T with the Maggies released the song Domhnach na Fola (Irish for Bloody Sunday), written by Mairéad Ní Mhaonaigh and Tríona Ní Dhomhnaill on their debut album. ^ The contamination discovered upon victim William Nash was solely discovered upon his right hand, whereas Nash had been left-handed. Nash had been one of the fatalities killed at the barricade and later placed by paratroopers into an Army APC. ^ a b c d e f g h i j k l m n o p q r s t u v w "'Bloody Sunday', Derry 30 January 1972". Conflict Archive on the Internet (CAIN). Retrieved 16 May 2007. ^ 'Bloody Sunday', Derry 30 January 1972 – Names of the Dead and Injured. Conflict Archive on the Internet (CAIN). 23 March 2006. Retrieved 27 August 2006. ^ Extracts from 'The Road to Bloody Sunday' by Dr Raymond McClean. Retrieved 16 February 2007. ^ David Granville (28 July 2005). "More 'butcher' than 'grocer'". The Morning Star. Retrieved 18 May 2007. ^ Nick Cohen (1 February 2004). "Schooled in scandal". The Guardian. London. Retrieved 18 May 2007. ^ "1972: 'Bloody Sunday' report excuses Army". BBC News. 19 April 1972. Retrieved 18 May 2007. ^ "Bloody Sunday inquiry: key findings". The Guardian. 15 June 2010. Retrieved 10 November 2015. ^ McDonald, Henry; Norton-Taylor, Richard (10 June 2010). "Bloody Sunday killings to be ruled unlawful". The Guardian. London. Retrieved 12 June 2010. ^ "Bloody Sunday report published". BBC. 15 June 2010. Retrieved 8 April 2011. ^ Significant Violent Incidents During the Conflict. Conflict Archive on the Internet (CAIN). ^ Peter Pringle and Philip Jacobson (2000). Those Are Real Bullets, Aren't They?. London: Fourth Estate. ISBN 1-84115-316-8. P. 293: "Youngsters who had seen their friends die that day flocked to join the IRA…"
^ Gallager; et al. (1983). Contemporary Irish Studies. Manchester University Press. ISBN 0-7190-0919-7. Retrieved 21 April 2011. ^ Bob Purdie (1990). Politics in the Streets: The origins of the civil rights movement in Northern Ireland. Blackstaff Press. ISBN 0-85640-437-3. Retrieved 21 April 2011. ^ Niall Ó Dochartaigh (1997). From Civil Rights to Armalites: Derry and the Birth of the Irish Troubles. Cork University Press. ISBN 978-1-85918-108-9. Retrieved 19 April 2011. ^ Geraghty, Tony (2000). The Irish War: The Hidden Conflict Between the IRA and British Intelligence. Harper Collins. p. 45. ISBN 978-0-00-638674-2. ^ a b English, Richard (2003). Armed Struggle: The History of the IRA. Pan Books. p. 141. ISBN 0-330-49388-4. ^ Taylor, Peter (2001). Brits: The War Against the IRA. Bloomsbury Publishing. p. 83. ISBN 0-7475-5806-X. ^ a b Brits, p. 84. ^ a b c d Brits, p. 82. ^ Macaskill, Jamie (28 March 2000). "Events surrounding one of the darkest days in history". Daily Record. Glasgow. Retrieved 29 January 2017. ^ 'Bloody Sunday', 30 January 1972 – A Chronology of Events. Conflict Archive on the Internet (CAIN). ^ Bloody Sunday Inquiry (2010). "Report of The Bloody Sunday Inquiry". 2.15–2.16. Archived from the original on 15 September 2010. Retrieved 22 April 2011. ^ Bloody Sunday Inquiry (2010). "Report of The Bloody Sunday Inquiry". 3.1. Archived from the original on 24 August 2010. Retrieved 22 April 2011. ^ "The beginning of the march - Chapter 14 - Volume II - Bloody Sunday Inquiry Report". Webarchive.nationalarchives.gov.uk. Retrieved 14 March 2019. ^ "'Relief and vindication in Derry at findings in 5,000-page report'". The Irish Times. 6 June 2010. Retrieved 26 March 2011. ^ Bingham, John; Prince, Rosa; Harding, Thomas (14 June 2010). "'Bloody Sunday: soldiers should face trial but not jail, families say'". London: The Telegraph. Retrieved 26 March 2011. ^ "'saville widgery'". The Independent. London. Archived from the original on 29 January 2013. Retrieved 26 March 2011. ^ "'Written Answers. – Bloody Sunday Inquiry'". House of the Oireachtas. Retrieved 26 March 2011. ^ Flanagan, Padraic (16 June 2010). "Bloody Sunday: March that led to deadly clashes". Sunday Express. London. Retrieved 29 January 2017. ^ Peter Pringle & Philip Jacobson (2000). Those Are Real Bullets, Aren't They?. London: Fourth Estate. ISBN 1-84115-316-8. P. 100: "…the level of rioting was no greater than usual – and no petrol bombs or nail bombs were being thrown." ^ Peter Pringle and Philip Jacobson (2000). Those Are Real Bullets, Aren't They?. London: Fourth Estate. ISBN 1-84115-316-8. P 116: "Seconds after the corporal fired, he would say that he spotted the same man with a black cylindrical object in one hand strike what appeared to be a match against the wall. Johnston was standing a few feet from Donaghy. One of the bullets sliced through his right thigh." ^ Siddique, Haroon; French, Megan (15 June 2010). "Bloody Sunday inquiry: key findings". The Guardian. London. Retrieved 29 January 2017. ^ "Report of the Bloody Sunday Inquiry, Volume III, Chapter 44: Conclusions on the treatment of those arrested in Sector 2". Webarchive.nationalarchives.gov.uk. ^ a b Kirkup, James (16 June 2010). "Bloody Sunday: the shooting lasted an hour, the inquiry took 12 years". Daily Telegraph. London. Retrieved 29 January 2017. ^ a b "Widgery Report". Conflict Archive on the Internet (CAIN). Retrieved 18 May 2007. ^ a b "Bloody Sunday: Soldier F faces murder charges". BBC News, 14 March 2019. ^ "Death of 'informer'". Derryjournal.com. Retrieved 14 March 2019. ^ a b John Innes (21 October 2003). "McGuinness is named as bomb runner". The Scotsman. Edinburgh. Retrieved 18 May 2007. ^ "Superb new look for Museum of Free Derrya". Derryjournal.com. Retrieved 17 June 2010. ^ "Inquiry urged to identify soldiers". BBC News. 23 May 2002. Retrieved 16 May 2007. ^ a b Brits, p. 96. ^ "The victims of Bloody Sunday". BBC News. 15 June 2010. Retrieved 29 January 2017. ^ Reginald Maudling (31 January 1972). "Northern Ireland". Parliamentary Debates (Hansard). House of Commons. col. 32–43. ^ "Bloody Sunday helped reconcile Southern nationalists to partition". Irish Times. ^ 1972: British embassy in Dublin destroyed BBC News Online. Retrieved 1 February 2009. ^ Coogan, Tim Pat (2002). The troubles: Ireland's ordeal, 1966–1996, and the search for peace. Palgrave Macmillan. p. 107. ISBN 978-1-57098-144-9. Retrieved 16 June 2010. ^ Ros Wynne-Jones (9 March 1997). "Daughters of Ireland". The Independent. UK. Retrieved 6 January 2015. ^ "Northern Ireland". Parliamentary Debates (Hansard). House of Commons. 31 January 1972. col. 32–43. ^ "1969: Devlin is youngest-ever woman MP". BBC. 17 April 1969. Retrieved 2 June 2007. ^ David McKittrick (26 January 1997). "Bloody Sunday: the ghosts that won't lie down". The Independent. UK. Archived from the original on 24 May 2008. Retrieved 2 June 2007. ^ 'Bloody Sunday', 30 January 1972 – A Chronology of Events. Conflict Archive on the Internet (CAIN). 23 March 2006. Retrieved 27 August 2006. ^ a b c d e f g "Bloody Sunday: Key soldiers involved". BBC News. Retrieved 28 September 2014. ^ Don Mullan (1997). Eyewitness Bloody Sunday. Wolfhound: Printing Press. ISBN 0-86327-586-9. ^ "Bloody Sunday victims 'innocent'". BBC News. 29 May 2007. Retrieved 29 May 2007. ^ "Bloody Sunday victims innocent says Jackson", Irish News (Belfast newspaper), 29 May 2007, pp. 1 and 11. ^ Nicholas Watt (19 March 2008). "McGuinness: there was no need for Bloody Sunday inquiry". The Guardian. London. Retrieved 31 December 2012. ^ "I was proud to lead the Paras on Bloody Sunday...don't dare say sorry for me, Mr Blair". Thefreelibrary.com. Retrieved 28 September 2014. ^ "BLOODY SUNDAY INQUIRY – Col Wilford: Don't blame my soldiers". BBC News. Retrieved 28 September 2014. ^ Conway, B (2010). Commemoration and Bloody Sunday: Pathways of Memory. Palgrave Macmillan. p. 34. ISBN 978-1-349-31032-6. ^ David Sharrock (30 March 2000). "Rumours of plan to clear Bogside are 'nonsense'". The Daily Telegraph. London. Archived from the original on 27 June 2002. Retrieved 16 June 2010. ^ The Irish War: The Hidden Conflict Between the IRA and British Intelligence, p. 65. ^ "Bloody Sunday Inquiry Transcript – Day 008". 6 April 2000. Archived from the original on 28 September 2007. Retrieved 17 May 2007. ^ a b c "Saville Inquiry into Bloody Sunday". BBC History. Retrieved 29 January 2017. ^ Van der Bijl, Nick (2009). Operation Banner: The British Army in Northern Ireland 1969 – 2007. Pen & Sword Military. pp. 52–53. ISBN 978-1-8441-5956-7. ^ "Bloody Sunday footage release calls". BBC News. 30 January 2003. Retrieved 18 May 2007. ^ "Concern over Bloody Sunday guns". BBC News. 3 April 2000. Retrieved 18 May 2007. ^ a b Brown, Derek (22 November 2004). "Q&A: Bloody Sunday inquiry". The Guardian. London. Retrieved 18 May 2007. ^ Philip Jacobson (14 August 2005). "Riddle of the Derry guns". The Sunday Times. London. Retrieved 18 May 2007. ^ "Bloody Sunday Report Published". BBC News. 15 June 2010. Retrieved 15 June 2010. ^ "Saville Bloody Sunday inquiry delayed until after poll". BBC News. 6 April 2010. Retrieved 6 April 2010. ^ "Report of The Bloody Sunday Inquiry". 15 June 2010. Archived from the original on 25 February 2011. Retrieved 15 June 2010. ^ "The overall assessment". Report of The Bloody Sunday Inquiry. 15 June 2010. Archived from the original on 3 November 2010. Retrieved 15 June 2010. ^ a b c John Bingham, Rosa Prince and Thomas Harding (15 June 2010). "Bloody Sunday Inquiry: victims were all unarmed and killed without justification, says Bloody Sunday report". The Daily Telegraph. London: Telegraph Media Group. Retrieved 15 June 2010. ^ "Bloody Sunday report states those killed were innocent". BBC News. BBC. 15 June 2010. Retrieved 15 June 2010. ^ "Report of The Bloody Sunday Inquiry – Volume I – Chapter 3". Bloody Sunday Inquiry. 15 June 2010. Archived from the original on 24 August 2010. Retrieved 15 June 2010. ^ "BBC NEWS – UK – N Ireland – Major gives Bloody Sunday evidence". Bbc.co.uk. Retrieved 28 September 2014. ^ "BBC News – Britain's propaganda war during the Troubles". Bbc.co.uk. Retrieved 28 September 2014. ^ "BBC News – Bloody Sunday: PM David Cameron's full statement". BBC News. Retrieved 28 September 2014. ^ "Bloody Sunday: Former British soldier released on bail". BBC News. 11 November 2015. ^ "Bloody Sunday: Soldier F faces murder charges". BBC News. British Broadcasting Corporation. 14 March 2019. Retrieved 14 March 2019. ^ correspondent, Owen Bowcott Legal affairs (14 March 2019). "Bloody Sunday trial will test limits of justice in Northern Ireland". Theguardian.com. Retrieved 14 March 2019. ^ Bowcott, Owen (14 March 2019). "Prosecutors explain Bloody Sunday murder charges against 'Soldier F'". Theguardian.com. Retrieved 14 March 2019. ^ "Why Soldier F will be charged over Bloody Sunday but other soldiers will not be". The Irish Times, 14 March 2019. ^ Bowcott, Owen (14 March 2019). "'People were devastated': relatives of Bloody Sunday victims on the charge". Theguardian.com. Retrieved 14 March 2019. ^ Kaufmann, Eric (17 May 2007). The Orange Order: A Contemporary Northern Irish History. OUP Oxford. p. 77. ISBN 9780199208487. ^ Wharton, Ken (21 October 2011). The Bloodiest Year 1972: British Soldiers in Northern Ireland in Their Own Words. The History Press. p. 46. ISBN 9780752472980. ^ This "Honeymoon period", as it has come to be known, ended around the time of the Falls Road Curfew on 3 July 1970. See CAIN for details here . The 'B-Specials' were disbanded and replaced by the Ulster Defence Regiment (UDR) on 1 April 1970. ^ "Bloody Sunday Victims Deserve Better Than This". The Times. 15 March 2019. Retrieved 16 March 2019. ^ "Paramilitaries in the Troubles". BBC History. Retrieved 29 January 2017. ^ RTÉ News (15 June 2010). "Bloody Sunday killings 'unjustifiable'". ^ Stratton, Allegra (15 June 2010). "David Cameron condemns Bloody Sunday killings and makes apology". The Guardian. London. Retrieved 29 January 2017. ^ "Sack soldier for Bloody Sunday slurs, urges brother of victim". ^ The seven ages of Paul McCartney BBC News Entertainment, 17 June 2006. Retrieved 27 August 2006. ^ Irish Genealogy John Lennon at New York protest. ^ "Poems of Bloody Sunday: Thomas Kinsella, Seamus Deane". indymedia ireland. Retrieved 29 January 2017. ^ Black Sabbath: Doom Let Loose, Martin Popoff; ECW Press, 2006. ^ Oddie, David (2015). A Journey of Art and Conflict: Weaving Indra's Net. Intellect. p. 144. ISBN 978-1-78320-500-4. ^ a b c d Bloody Sunday in popular culture 15 June 2010. telegraph.co.uk. Retrieved 20 June 2010. ^ "Heaney in Chicago". Critical Inquiry. Retrieved 29 January 2017. ^ Minds Locked Shut Archived 27 September 2011 at the Wayback Machine, christymoore.com. Retrieved 20 June 2010. ^ Bolther, Giancarlo. "Interview with Keith Fay". Rock-impressions.com. Retrieved 24 March 2008. ^ Liz Hoggard (27 March 2005). "Out of crises, a drama". The Guardian. London. Retrieved 19 February 2009. ^ "Bloody Sunday: Scenes from the Saville Inquiry". Dublinks. 2005. Archived from the original on 1 October 2008. Retrieved 19 February 2009. ^ "Bloody Sunday: Scenes from the Saville Inquiry". Tricycle Theatre. 2005. Archived from the original on 5 April 2005. Retrieved 19 February 2009. ^ "T with the Maggies: Domhnach Na Fola". allmusic.com. Retrieved 29 January 2017. Eamonn McCann (1998). Bloody Sunday in Derry. Brandon: Printing Press. ISBN 0-86322-139-4. Dermot P.J. Walsh (2000). Bloody Sunday and the rule of law in Northern Ireland. Gill & Macmillan. ISBN 0-7171-3085-1. Jennifer Faus (2007). Before Sunday. Nonsuch Publishing. ISBN 1-84588-573-2. Wikimedia Commons has media related to Bloody Sunday, Derry. Britain Acknowledges "Bloody Sunday" Killings Were Unjustified and Apologizes to Victims' Families – video report by Democracy Now!